A few tips to help get your foot in the door. Have you ever wondered what it takes to land your dream job? This post is a collection of the details that can help you move from being an interviewee into an being an employee. This is the first impression they will have of you, so it should be tailored to them. Do some research on the company you are contacting and in your letter talk about something that interests you about them – it could be a project or an aspect of their philosophy. For extra credit, do some research about the person you are contacting, mention something you have in common, or simply let them know what inspires you about them. Your chances of landing an interview are much higher if you have a personal referral. Look wide in your network – one of your professors, family members, or perhaps even alumni from your school may have a personal connection to one of the firms you’re interested in. Ask them to make an introduction. Attend events where you’ll run into the people you want to work with. Events by organizations such as AIGA and the Ad Club are a good place to start. Look out for principals or other members of the design firms you are interested in. Walk up to them and introduce yourself. Follow up with a handwritten note. For extra credit, volunteer and make a difference in these organizations – its a great way to meet people and demonstrate your capacity to accomplish tasks as a team player. Of course your resume should be impeccable: perfectly spelled and including all the details of your education, past work experience and relevant interests. As a designer, it should also be a reflection of your personality and creativity. It should be beautifully and functionally designed. A little wit and humor can show that you’d be easy and pleasant to work with. But tread lightly, don’t add too much decoration or too many jokes, which can distract from what is essential. In addition to showcasing your work, your portfolio site should embody the best example of what is possible on the Web, demonstrating that you are skilled in the latest web developments. Like your resume, it is a peek into who you are. Include engaging details about you or your interests that would inspire someone to want to meet you. Every piece of work you show, on your website or during an interview, should be the best work you have ever seen. Take a look at the work in your portfolio. Is every piece the best work you have ever produced? Is it the best you can imagine it to be? Does it stand up to the best work of other designers you have seen, whether they are your peers or design stars that you admire? If the answer to any of these questions is no, keep working on it. The firms with the best jobs typically have very little turnover. You want to make sure you are on their “radar” so when they do start looking to hire, you are already on their list. Start by asking for a 20 minute informational interview with one of the principals. Their first answer will probably be no. Be polite and persistent. Acknowledge that you know their schedules are busy, and share what a difference it would make for you to get their feedback and advice. Make the best of your brief time with the person interviewing you by conducting a well choreographed, smooth presentation of your work. Practice with your friends, family members and instructors. When you arrive at the interview, while you are waiting, put your phone away, sit up straight, and take in the space around you. You can learn a lot about the firm by looking around, and you will feel more relaxed and confident by being fully present. Don’t use your website as the whole presentation during your interview – chances are the person interviewing you has already seen it. Also, make sure you are able to present your work as if you were meeting the person in a park – don’t assume that a wireless connection, or worse, a computer will be readily available for you to use. Immediately after the interview, mail a hand written thank you note to the person who interviewed you. Have a blank one with a stamped envelope handy in your portfolio, so you can write it as soon as you’ve left the building and drop it in the nearest mail box. Extra points if you’ve designed and printed the note yourself. Every step of the way, have confidence in who you are and reach for your wildest dreams. Show your passion for design. Lead a full life. Be open, curious and disciplined. 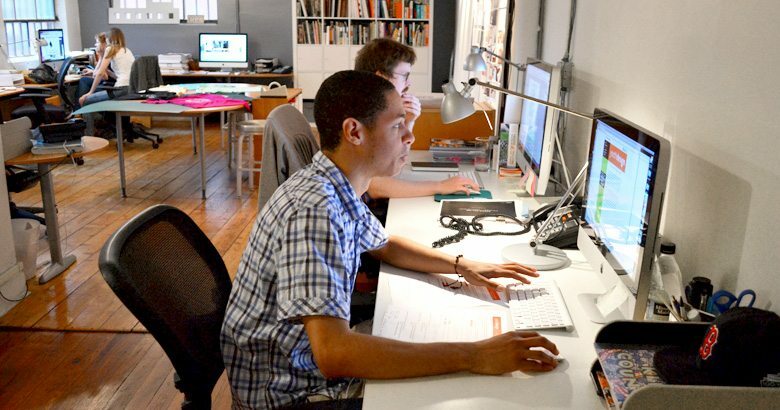 With persistence, focus, and a little luck, you’ll be sure to land your dream design job.